First ever pre owned vehicle video shopping tool is launched by WheelsTV. With POV reviews, consumers can do 5 hours of research in just 5 minutes. POV reviews make buying and selling used cars easy. Their consumer research and crash test data are brought to life with POV Reviews, making the purchase process easy and pleasurable. 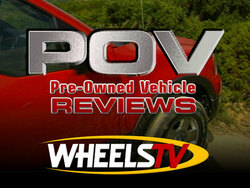 WheelsTV today launched POV Reviews, comprehensive video reviews of late model pre-owned vehicles. This suite of videos incorporates JDPower.com's Power Circle Ratings™, based on feedback from verified vehicle owners derived from J.D. Power and Associates' annual syndicated studies. These ratings, along with EPA fuel economy numbers and crash test data are brought to life with full-motion, broadcast quality video from WheelsTV.With POV Reviews, consumers can now do five hours of research in just five minutes, getting a comprehensive review of every make and model within a generation of each vehicle. This is a new and effective tool that helps consumers find the right vehicles for them and, at the same time, assists on-line vehicle shopping services and auto dealers in selling pre-owned vehicles." stated Lehel Reeves, president of WheelsTV. POV Reviews™ make shopping for a pre-owned vehicle quick and easy, gathering consumer feedback from millions of motorists, conducting independent research and encapsulating findings into brief, informative video programs. JDPower.com's Power Circle Ratings are presented in an easy to understand video format that demonstrates important vehicle attributes from dependability to performance, safety and comfort. Data is collated and encapsulated into concise narrative and clear, easy to read data screens, which cover multiple vehicle years and demonstrate trends. "POV Reviews present the JDPower.com Power Circle Ratings in a way that's useful and meaningful to consumers," said Peter Marlow, vice president of corporate communications and consumer development at J.D. Power and Associates. "We're pleased to work with WheelsTV to present information in a way that gives consumers the information they want, when they want it, in a rich media format." In addition to JDPower.com's Power Circle Ratings, safety and crash test data is presented in association with the Insurance Institute for Highway Safety, including actual crash test video documentation and ratings. WheelsTV's patent pending process combines the data screens, action footage of each vehicle, voice-over narration, music and effects to create a valuable tool for both those buying cars and those selling cars. "We are very pleased to be working with J. D. Power and Associates and the Insurance Institute for Highway Safety in bringing this valuable consumer product to the motoring public," said Jim Barisano, CEO of WheelsTV. " Their consumer research and crash test data are brought to life with POV Reviews, making the purchase process easy and pleasurable." Today, pre-owned vehicles out-sell new vehicles by three to one. With POV Reviews™, consumers are given the ability to quickly and easily research, compare and choose the best pre-owned vehicles for them, saving time and money. This pre-owned vehicle-shopping tool is the first video product to serve the world's largest consumer market at a time when more motorists are turning to pre-owned vehicles to fill their transportation needs. For more information, please contact Theresa Carlo at WheelsTV: TCarlo(at)WheelsTV.net, 978-264-4333. Headquartered in Acton, Massachusetts, Automotive Networks Corporation, d/b/a WheelsTV, creates and distributes exclusive original content domestically and worldwide on the Internet, broadband, VOD and 3G mobile platforms. WheelsTV's patent-pending products include Top 200™ Test Drives and1:00 on One™ Vehicle Profiles, providing the optimal consumer experience to its distribution partners including, J.D. Power, AutoTrader, MSN, AOL, Amazon, AutoNation, Yahoo, Vehix, NADA Guides, Chrome Systems, Reynolds and Reynolds, Cobalt, AutoData, Kia, Azuki Systems mobile, Comcast On Demand, Cablevision, and OEM franchise dealers throughout North America. Patent Pending. Copyright 2009 Automotive Networks Corporation. All rights reserved.